Iona (Scottish Gaelic: Ì Chaluim Chille)  is an island in Scotland. One of the Inner Hebrides, it is 3.5 miles long and 1.5 miles across. The island only has two major settlements, Baile Mór and the Iona Community. There are only 177 permanent residents, but half a million tourists and pilgrims visit each year. The monastic community on Iona was founded in 563AD by Colum Cille (St. Columba) from Ireland, who was driven out of his homeland in the 6th c. and settled on Iona with his monks. He chose Iona because it was the nearest point to Ireland from which he could not see his homeland. This was the home of Celtic Christianity for six hundred years until King David suppressed it in the twelfth century. Iona remained a major pilgrimage site until the reformation when the island was sacked and the community scattered. In the early twentieth century, the abbey was rebuilt and a new monastic community has begun here, providing much of the tourism for the island. A Caledonian MacBrayne  ferry service operates from the village of Fionnphort, on the isle of Mull, and operates on an approximately hourly frequency between 7.30am and 6.30pm. At the height of summer season, it operates on demand between 10.00am and 4.30pm. During summer season, many of the independent boat trips to Staffa (and other islands in the area) also call at Iona en-route; this can be used as an alternative to the scheduled CalMac service. As is the case with all ferry services on the Scottish west coast - bad weather can alter or even cancel schedules leaving the potential to be stranded on the island during stormy seas - despite the short crossing the Iona ferry is prone to this. Usually, CalMac staff at Fionnphort will advise against making the crossing during periods of inclement weather if you are a non-resident. The ferry from Fionnphort connects with bus number 496 to Craignure, which connects with a CalMac ferry service from Oban. Oban has train services from Glasgow via the West Highland Railway, and Citylink  bus services from Glasgow and Fort William. The journey from Glasgow to Iona takes approximately 5 hours. The bus and ferries will wait for incoming services to try to keep the connections. Visitors' cars are not permitted on the island, except by special permission being obtained from Argyll and Bute Council beforehand - which is extremely difficult to get in any event and not really worth it unless you can prove you need a car on Iona. Parking is available at Fionnphort but note that the car park next to the ferry terminal is quite expensive – a free car park exists a short walk away at the back of the village but it pays to get there early as it can fill up very quickly at the height of season. Iona has one taxi. If you stay in one of the retreats or hotels, then you may be collected from the quay by car. You can hire bicycles from the Iona Craft shop in Baile Mór. Otherwise you need to walk. 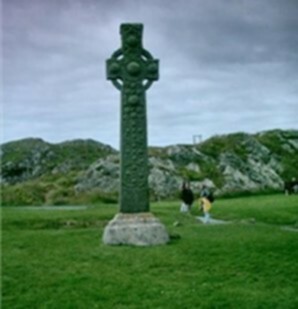 MacLean's Cross outside the parish church - one of the few surviving stone crosses on the island. The Lewissian Gneiss rocks on the Western half of Iona are ~ 2 Billion years old and are some of the oldest in Europe. They are a mixture of pink, white, red, green and black. ancient cross in the churchyard of the abbey. Walk to the top end of Iona where there are several beaches with white sand, clear water and beautiful rocks. The views are stunning views back towards the Ross of Mull or to the North to Tiree, Coll, The Treshnish Isles, Staffa, Eigg, Muck, and Skye. This walk can be combined with a visit to the Abbey, which is en route to the beaches. Walk to South West coast of the island to the beach at Camas Cuil an t-Saimh. To the south of the bay there is a spouting cave. There is a bar near the quay in Balle Mor, and in the hotels. Iona Hostel  - £17.50 Adults, £12.00 Children. The hostel in a fantastic location on a sheep farm to the North of the island. It has 21 beds in 5 rooms, with a good kitchen for self-catering. It's safe. The biggest danger on Iona is from the elements. In 1998, four men from Iona were killed when their boat capsized on an evening trip to Mull . This page was last edited on 12 October 2018, at 19:14.